Week 37 (September 10-16) – Large Family. So let’s feature an ancestor who had a large family or who was a member of a large family. 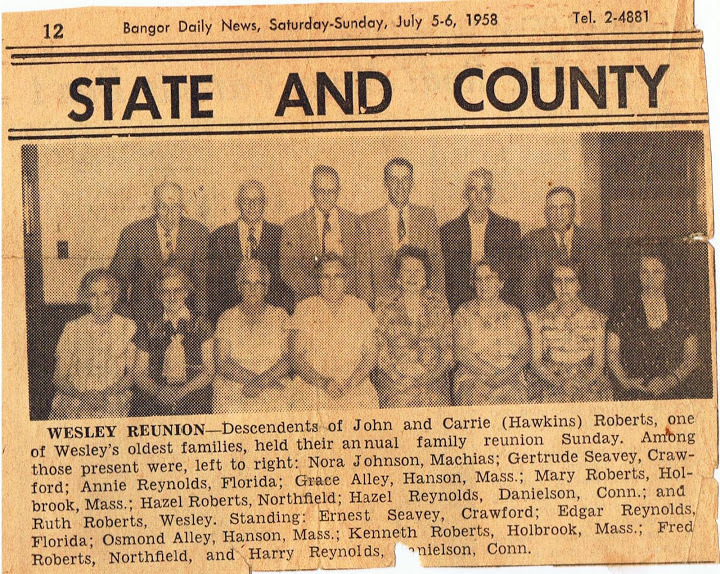 My great-great-grandparents, John Milton Roberts & Carrie Evelyn Hawkins had thirteen children between 1887 and 1911. He worked as a farmer and lumberman his whole life, supporting his family. Carrie was 17 when she married the 29 year old John Milton on July 24, 1886 in Wesley, Washington County, Maine. 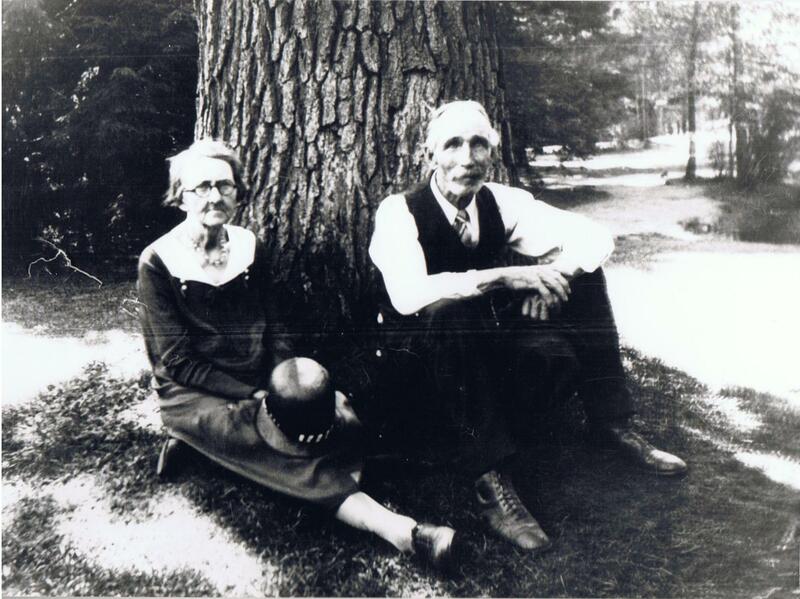 Her first child was born on August 1, 1887 when she was 18, and he was 30 – Nora Mae (1887-1974). Gertrude Bradbury (1889-1977) was born on January 31, 1889 when Carrie was 20. Nellie Grace (1890-1968) was born on December 14, 1890, and Annie Laurie (1892-1963) was born December 24, 1892. Their first son was born October 14, 1894 when Fred Oscar (1894-1959) arrived, followed by Walter Roscoe (1896-1917) and his twin sister who died at birth on November 2, 1896. Ethel (1897-1992) was born on December 20, 1897, Hazel Pearl (1900-1990) – my great-grandmother- was born April 4, 1900. Ruth Eva (1901-1988) was born on July 31, 1901, Evelyn Marie (1903-1987) was born August 8, 1903 and another son, Kenneth Paul (1906-1977) was born on September 21, 1906. The last child, John Milton Jr. (1911-1989) was born on December 10, 1911 when Carrie was 42 years old. When Carrie & John were having their second to last child, Kenneth Paul, their eldest daughter, Nora, was having her first son, William Elliot McLain (b. June 1, 1906) and Gertie, the second daughter, had three children by the time their last son was born – Eva Belle (1908-1945), Georgia Louise (1909-2008) and Forrest Paul (1910-1998). Third daughter, Nellie Grace, had her first son, Osmond Filmore Alley Jr on March 12, 1911 (1911-1993) just a few months before her youngest brother was born. 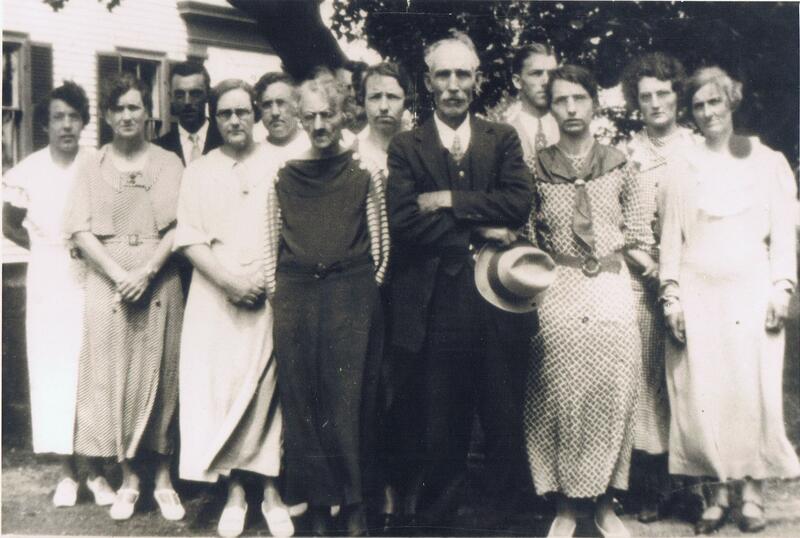 Before Carrie died in 1949, all of her 63 grandchildren were born, and several of her great-grandchildren were born. Six of those grandchildren died young. Two of her own children – Walter Roscoe at 17 and his twin sister at birth – were also gone. This entry was posted in Graff/Roberts/Reynolds/etc.. Bookmark the permalink. My dad, Milton, and Ken were close friends in childhood as well as adults. If your interested in more re my family, lets correspond. Email or phone I’d give to you privately. Hi Helen! Lovely to meet another cousin! You can reach me at kessgen at gmail dot com.